One Gay American was a finalist in the 2013 Indie Excellence Awards and 2013 Next Generation Indie Book Awards. The Advocate voted Bensie’s first memoir, Shorn: Toys to Men, “One of the Best Overlooked Books of 2011.” The New York Journal of Books called Shorn: “Bracingly honest.” The Library Journal recommended it as “particularly topical in these days of bullying stories and gay teens committing suicide.” Shorn was also a finalist in the 2013 Indie Excellence Awards. 5 Stars: “A riveting and poignant attempt at explaining his life to the reader in the most vivid detail. Grab some tissues and a nice big carafe of warm coffee because you will need it …. Dennis is a wonderful writer, one that will transport all readers to another dimension of reality, one that was very cruel and harsh to gays. Thank you Dennis for such a wonderful book!” Read more …. Dennis Milam Bensie is One Gay American. Born in the 1960s and raised with traditional values in Robinson, Illinois, Bensie desperately wanted romance, a beautiful wedding, and a baby to carry on the family name. He denied his sexuality and married a woman at nineteen years old, but fantasized of weddings where he could be the bride. The newlyweds “adopted” a Cabbage Patch Doll and ironically witnessed a Cabbage Patch Doll wedding (a successful fundraiser staged by a local women’s club) where the dolls were granted the type of grand ceremony off-limits to gay couples. In search of his identity as a gay man, Bensie divorced his wife and stumbled through missteps and lessons that still sting his generation: defending against bullies, “disappointing” his parents, and looking for love in gay bars, bath houses and restrooms. He helped his straight friends plan their dream weddings and mourned his gay friends dying of AIDS. Although true love has not yet come his way, Bensie has learned to love himself. Bensie is the author of the much-lauded memoir, Shorn: Toys to Men, which recounts his battle with paraphilia. One Gay American tells the rest of his story and draws parallels to gay history, decade by decade, with newspaper headlines and quotations. Bensie is the gay neighbor that you either love or hate. Either way, he’s got a lot to say and says it with no apologies. Dennis Milam Bensie grew up in Robinson, Illinois where his interest in the arts began in high school participating in various community theatre productions. He holds a degree in Theater Costume Design from Southern Illinois University at Carbondale and completed an apprenticeship in theatrical wig construction at Los Angeles Opera. His costume and wig design for Valley of the Dolls at Empty Space Theatre in Seattle garnered him a feature article in Entertainment Design Magazine and a Seattle Times Footlight Award for Best Design. Bensie was the Wardrobe and Wig Master at Intiman Theatre in Seattle for twenty seasons. Bensie is single and lives in Seattle with his three dogs. You can find him on the Web at www.dennismilambensie.com. 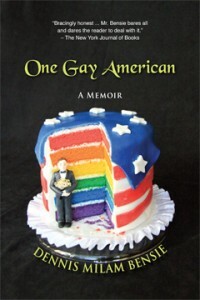 One Gay American is available e-book and paperback editions at select Barnes & Noble and independent bookstores as well as Amazon.co.uk, Amazon.de, and Amazon Japan. Bookstores and libraries can order through Ingram or Baker & Taylor or by contacting info@coffeetownpress.com. Libraries can also order through Midwest Library Service or Follett Library Resources. Jessica accepted the invitation on the condition that I be allowed to come with her. Her mother hesitantly agreed, while protesting that the event was supposed to be “women only.” I had always wanted to go to a wedding shower. This would be my first, and I was scared out of my mind. Jessica and I were stunned to walk in and see over fifty women presiding over a huge stack of gifts at the head of the church’s reception hall. Her perpetually scowling mother was all smiles as she guided us around and introduced us to her church friends. We were both surprised to see so many people and impressed by the spread of homemade goodies. There were cakes, pies, and cookies everywhere. Perhaps the evening wouldn’t be so bad after all. We quickly realized we had nothing in common with the church folks. Conversations fell flat. Effeminate and much younger than Jessica, I stood out almost as much as if I had shown up wearing Jessica’s wedding dress. After half an hour of uncomfortable mingling, it was time for the real festivities to begin. Jessica looked very nervous as her mother led her to the front of the hall. I was more than happy to stay out of the way as Jessica began the overwhelming task of opening all the gifts in front of the crowd. By the fifth or sixth gift, there was a particularly awkward moment. Jessica turned bright red. She continued unwrapping a box and revealed to the room a brown glass baking dish exactly the same size and brand as one she had opened a few minutes earlier. She politely laughed it off, but I watched the women in the group bristle. The room became deathly quiet. A few more gifts were unwrapped, and another brown-glass baking dish popped up, same size and brand. Jessica was speechless. I could see her trembling all the way from the back of the room. Everyone else remained still. I was just as nervous when I realized that several of the gifts yet to be unwrapped were the same size and shape. Many of the boxes were even wrapped in the same wrapping paper. I watched my fiancée open another, and another, and another box containing the same brown glass baking dish. It didn’t take long for me to figure out that there must have been a sale at Wal-Mart. By the end of the evening, over half of the gifts Jessica got from the church ladies were the exact same brown-glass baking dish. My future mother-in-law was embarrassed and had to leave the room for a moment. The evening ended with a thud. Jessica gave a meek thank you speech and latched on to me tightly as we prepared to leave the church. We were both polite, yet timid, as we said our goodbyes and quickly loaded all the gifts into the car. Once we were alone in the car, Jessica and I could finally laugh about the situation. Yet the evening had a major impact on me. I had seen clearly that all the people who came to the wedding shower spent their whole lives following the herd. The cakes, pies and cookies were delicious, but fed a small, petty world. The people we met that evening were proud small-town folks who all dressed alike, talked alike, prayed together, and shopped at Wal-Mart. It was the only world they knew. The whole scene was as American as a Norman Rockwell painting. Was that really what I wanted? The Saturday Evening Post? Was that enough? It was the only world I knew, too.